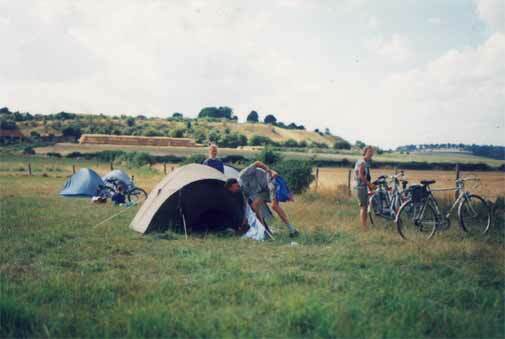 I was on a bicycle tour of the south of Britain when we camped below the ramparts of Old Sarum, the ancient fort just north of the modern town of Salisbury. The ramparts were probably first constructed around 1000 BC as Bronze Age tribal groups sought to protect themselves and their cattle. 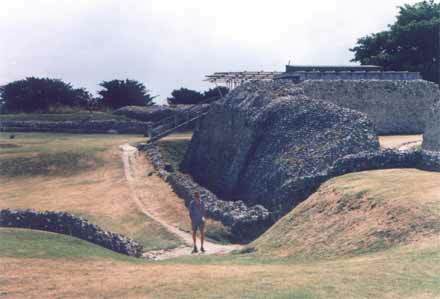 In the late Bronze Age and early Iron Age the ramparts would have been strengthened and a barbican constructed outside the main gate. The fort would then have experienced little change until the invasion of the Roman Empire in AD 53. Having subdued local resistance, the Romans brought a period of relative stabilty to the bulk of what is now England. 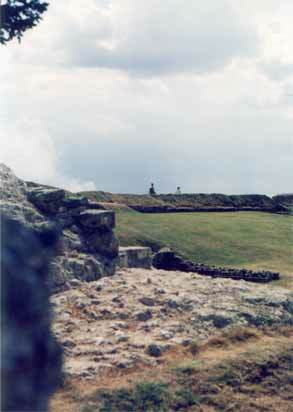 At Old Sarum this is evidenced by the fact the the hillfort appears to have served as little more than a garrison. The Roman settlement (such as it was) established itself a few hundred yards from the fort, down at the bottom of the river valley at what is now Stratford-Sub-Castle. It is clear that the settlement established here, although not terribly large, would have been of some importance as four main Roman roads converge on the old fort. Sorviodunum was on a crossroads of the road from Venta Belgarum/Winchester, Isca Dumnoniorum/Exeter, Durnovaria/Dorchester, Calleva/Silchester and even a fifth road to the lead mines in the Mendip Hills. 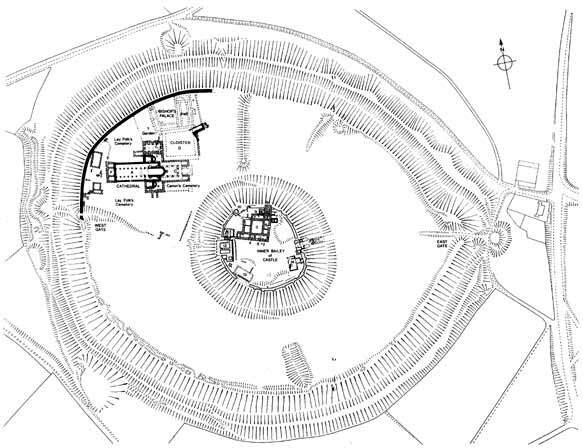 Most probably Sorviodunum/Sarum would have been the site of a regular market and other forms of trading which depended on quick efficient transport and communications. However, the signs of Roman occupation are only slight. Some coins date to the 1st and 2nd centuries, with the most coming from the 3rd and 4th. Other finds are from Stratford-sub-Castle, being the fields to the west of the fort, and from the fields to the south. 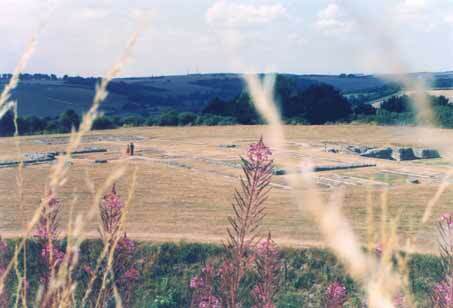 There were other Roman buildings around, but no Roman town of importance has been found. The road junction itself was, strangely enough, never occupied. Our tents in a field just east of the fort. Jan and the impressive remains of the Norman keep. The foundations of the first cathedral. Looking east, with the Roman road to Winchester coming in from the right. 552 This year Cynric fought the Britons at the place now called Salisbury, and won. Her Cynric gefeaht wi� Brettas in ��re stowe �e is genemned �t Searobyrg. 7 �a Bretwalas gefliemde. We may take this 'Saxon' takeover with a pinch of salt, as the name of the Saxon king (Cynric) is a British one (Cunorix), as is the name of his father Cerdic (Ceredig) and his son Ceawlin (Collen). Recent thoughts on this subject see the West Saxons as having been of very mixed origin, only to be 'germanised' later when the Anglo-Saxon culture had taken over England. 'Celtic' finds in north Wiltshire and the growing certainty that the West Saxons (or Gewissae as they were called earlier) started out in the Thames Valley, may strengthen this view. In all probability, the kingdom of Wessex conquered Salisbury only later, after the (equally mixed) kingdom of Mercia started to push south from the Midlands. The 'Saxon' origins of Wessex were acquired after it took over south Hampshire and the island of Wight from the Jutes. Anyway, the new owners thereafter made use of the fortifications and a sizeable town developed. The Saxon settlement must have been fairly formidable as it was given a wide berth by the invading Vikings of King Sweyn in 1003. Other settlements in the area were not so lucky. The nearby town of Wilton, only four or five miles away, suffered badly at the hands of the Vikings. The fortress eventually did change hands following the Norman invasion of 1066 and it was then that the most striking remains seen today were first built. 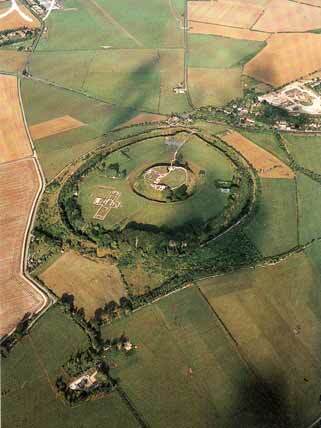 As you can see from the aerial photograph the hillfort was remodelled into a Norman Motte and Bailey design. The first wooden fort was constructed in 1069 when the central Motte was constructed. 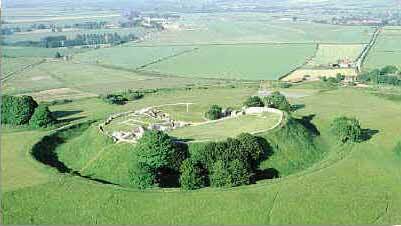 In 1070 William the Conqueror paid off his entire army in the outer bailey of the new castle and in 1089 the major landholders of William's kingdom gathered at Old Sarum to swear their oath of loyalty. Ellen & Annie on the rampart. The ramparts form a very nice circular walk. The end of the visit. Jan and Anie leaving through the old gate, with the Roman road visible just ahead. A nice shot of the Norman keep inside the Iron Age hillfort. 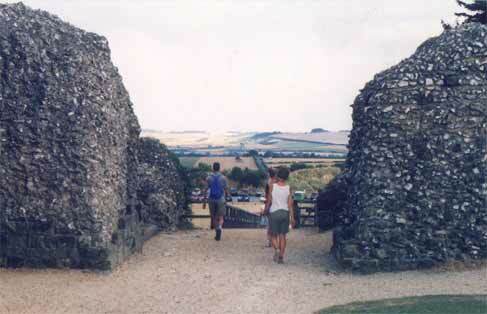 A good view of Old Sarum. The Roman town lies in front. 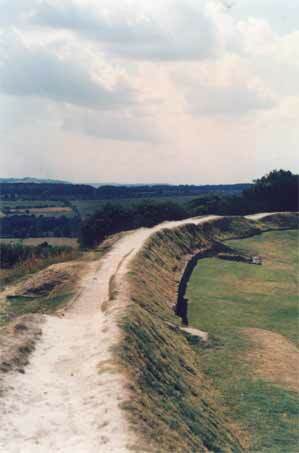 The hillfort of Old Sarum lies to the immediate north of the modern town of Salisbury. A 15 minutes bike-ride will get you there, but there is a bus connection as well, and of course you can park the car close by the monument. There is an admission fee to enter the Norman inner fortress, but when you are not interested in that, or the very nice views from the top of the ruins, you can wander around the outer area for free. This area is what's left of the original Iron Age fortress, and one can but wonder how many people may have lived here at one time, or Vortigern's time for that matter. During late summer, there's usually a re-enactment event which can help imagining what those times were like. That day, we had just moved camp from Shaftesbury, but the map showed a camp site which was no longer there. Salisbury was very disappointing, an industrial town despite the beautiful inner city around the ancient cathedral. So we moved on towards Sarum, where we found a spot in a field just east of the hillfort. On the whole, with the very nice weather, there could have been worse spots. Of course, we visited the hillfort that day, which was imposiing despite the heat of the afternoon. The outer ring was an empty circle of grass around the core, which was of course the ditch and citadel of Norman times. The remains of that, though robbed of stone long since, are still good enough to pay a visit. 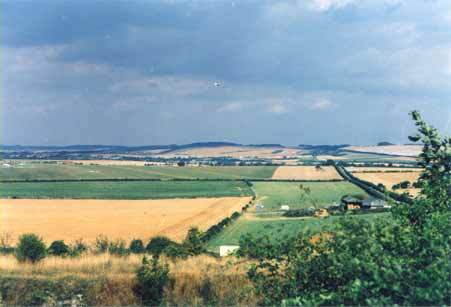 The views of the countryside and Salisbury are also very nice. Just too bad there isn't anything Roman here, with the town long since vanished under the fields to the west. Or was it actually inside the fort? There are enough Roman roads here though, which was of course the reason for this site to become a town. That night we went back after 2300, to be a little naughty but also to enjoy the silence of the ruins in a warm summer's night. Sure, we climbed a fence, but we would never do any damage to such a monument, rest assured. Well, I did not rest assured after all. The stars were very beautiful from were we chatted in the night on the rampart, but I felt restless. As if, I don't know, we did not belong there in another way. No ghosts, but spooked.